Day 1  Depart home country. International travel day. Day 2  Arrive in La Paz. You will be met at the airport by your BAI guide and they will take you to your hotel. One of the most fascinating cities in South America, La Paz is located more than 12,000ft/3,650m above sea level. 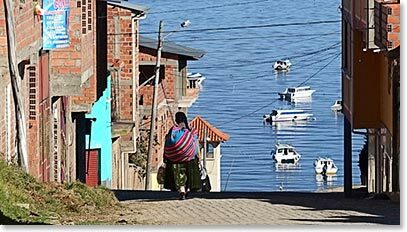 Day 3  Morning departure for Copacabana on Lake Titicaca, elevation 12,500ft/3,812m. It is hard to imagine more lovely spot to continue our acclimatization. This historic, relaxed city is steeped in native and colonial culture. We will stay at a hotel along the lakeshore. 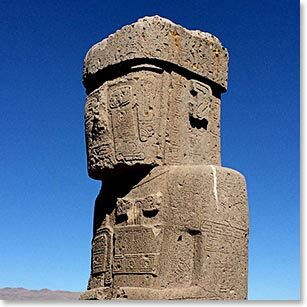 We visit Tiwanaku, a pre-Columbian archaeological site on the way to Lake Titicaca. 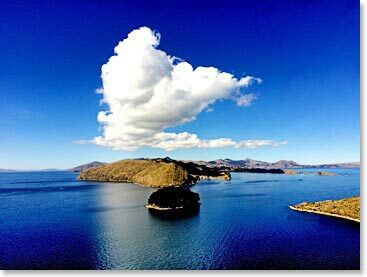 Day 4  In the morning we will travel by boat to Isla del Sol (Island of the Sun). There are no roads or cars and the 5,000 inhabitants of the island live much as they have for centuries. 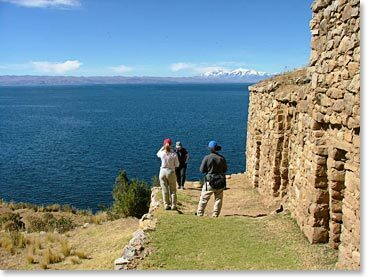 We will visit the Chincana Inca ruins during our walk. The small clean villages of the present day inhabitants are friendly and scenic. In the evening we will be picked up by boat and return to our hotel in Copacabana. Day 5  We will depart early in the morning for the Cordillera Real. We will head towards “La Rinconada” at the end of the road. 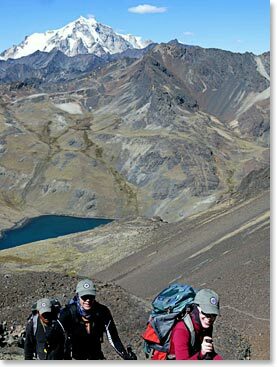 From there, we begin our 2hr walk to the Chiarkota Lagoon at 15,091ft/4,600m surrounded by the snow-cap Condoriri Range. 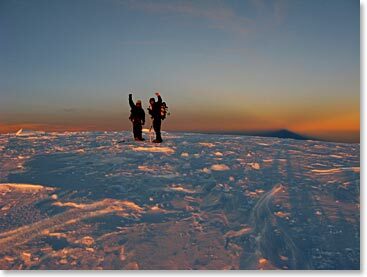 Day 6  Acclimatization day, we will climb Cerro Austria at 17,430ft/5,315m. 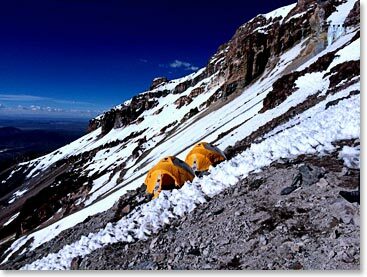 Our beautiful Condoriri Base Camp is a perfect home. 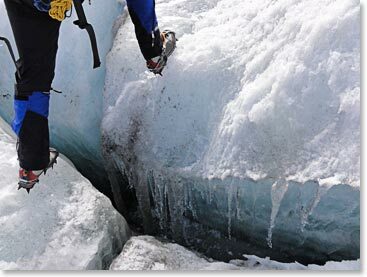 Day 7  Today we will climb onto the glacier and review our technical skills. 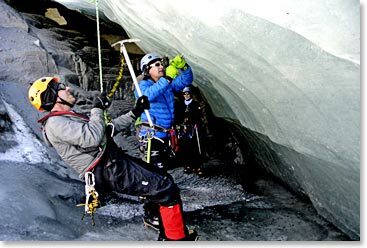 We will cover crampon technique, roped team travel, snow and ice climbing. Return to base camp. Day 8  Another day to practice climbing skills. 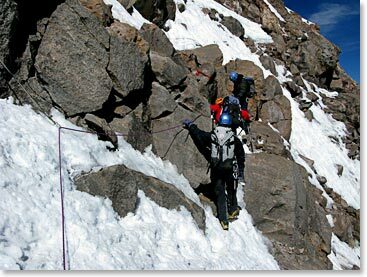 We will prepare gear and have an early dinner in order to get ready for Pequeno Alpamayo summit day. 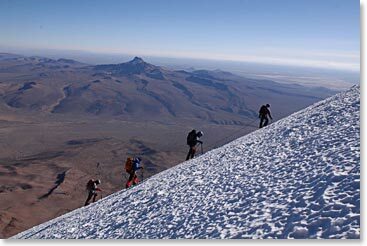 Day 9  We will depart in the early hours, at approximately 4 am, for our climb of one of the most beautiful peaks of the Andes, Pequeno Alpamayo 17,618ft/5,370m. 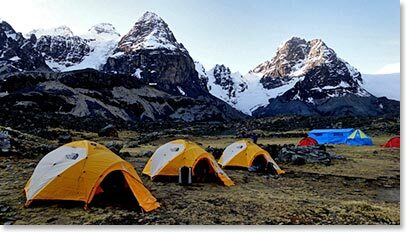 Day 10  Today we will hike away from the beautiful place that has been our home for the last five nights; Condoriri Base Camp. We will drive back to La Paz for the night. 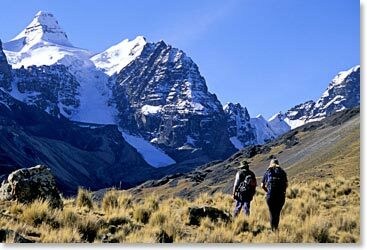 Those on the Condoriri – Pequeno Alpamayo only program will return to La Paz and depart the next day to their home country. Day 11  Morning departure to the village of Sajama where we will spend the night. Llamas greet us in Sajama Village. 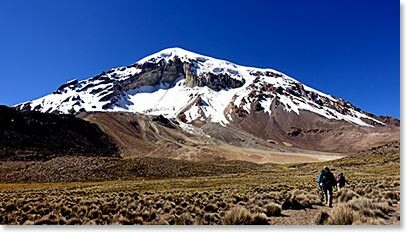 Day 12  After hiking for four to five hours we will reach Sajama Base Camp which is located at 15,750ft/4,800m. 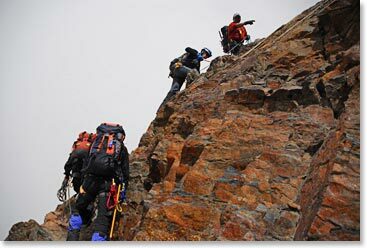 Day 13  Climb to high camp at 17,900ft/5,450m. Today’s climb should take us about five hours. Day 14  Summit day. 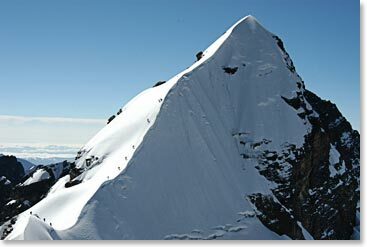 Sajama (21,464ft/6,542m) via the Northwest Ridge is primarily a glacier and snow climb with some rock sections. We will return to high camp for the night. 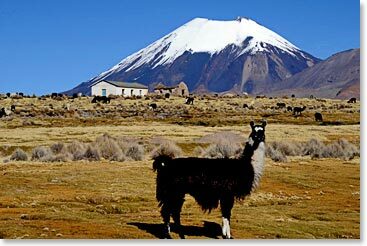 Day 16  Descend from high camp and hike back to the Sajama village and start our drive back to La Paz. 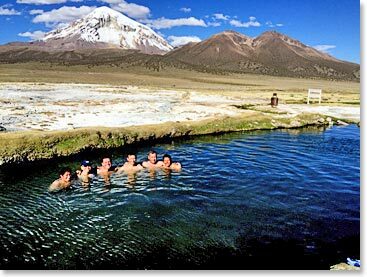 The perfect way to end a climb – soaking in natural hot springs!